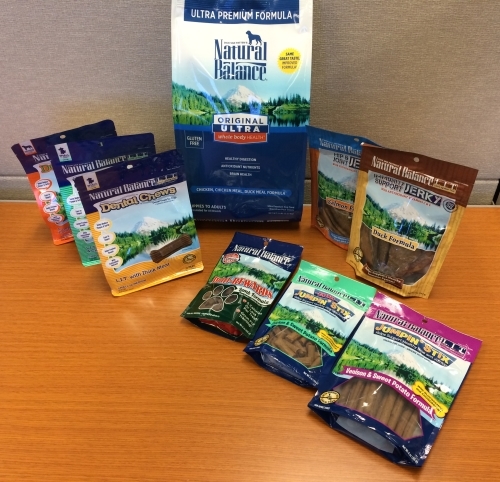 Recently I reviewed Natural Balance’s new limited ingredient treats. Yum! Well, guess what???? Lisa Marinacci from Natural Balance Inc. offered a gift basket for me to give away to one lucky reader! Is that cool or what? Really? All this? It’s a doggy paradise!!! Looks like a heck of a great prize to me! So I guess now you’re wanting to know how you can get into the drawing for these great Natural Balance treats. Just leave a comment below stating that you live in the US and you’d like to be a winner! A winner will be chosen at random from all the comments at the end of the day on Thursday. Oh, and don’t forget to vote every day for your pal Rumpy to be this year’s winner of the DogTime Petties Best Cause Blog! Click here to vote for Rumpydog for the Petties Best Cause Blog! You can vote once per day. Good luck to all doggies, that looks really like the doggy pawradise! I know! I wish I could enter! We live in the US! Bella would like to try this! I’m sorry. That was a stipulation of Natural Balance . We use Natural Balance here for the cats. I am assuming these are doggie things. My cats are *pouting*. Yeah, so was June Buggie. But he still tried to eat them. Definitely live in the US. This would be a real win! I have three older dogs and they LOVE treats! We would make good use of them. We live in Kansas, which the last time I checked was in the USA! Yeah, let’s hope they don’t secede before Thursday! Whoa! Two entries from Kansas! It’s an omen! We live in the USA and would love to win those treats. Good luck, Millie and Walter! Good luck Rumpydog! I just voted for you! I know! Isn’t this exciting???? Mac and I live in the US and Mac would love some Natural Balance treats! Next stop is to vote! I gotcha in the drawing! And thanks for the vote!!!! I don’t blame you! You guys would LOVE these treats!!!! My six dogs and I live in the beautiful Texas Hill Country. When I was growing up, I wasn’t allowed to have a dog, but rescued my first one at age 52 – me, not the dog!. Like the ad says: “You can’t have just one.” I’m happily rescuing all the pooches I didn’t have throughout my life. AND, Doc Holliday, Johnny Ringo, Annie O., Big-Nose Kate, San Antonio Rosie and Amazin’ Gracie all LOOOOOOVE treats. Please add this entry to the hat!!!! Judith! You won my last contest and never responded to our emails, so we had to give the prize to someone else! I love winning ANYTHING – especially treats and yummy stuff. I live in the US. PS – our vote is in! Cupcake, this is enough treats to last you a long time! woo woo! All my furry kids are too excited to stop barking long enough for me to explain that we might win, but probably, because there are many eager doggies out there, will not. And anyway, they aren’t exactly neglected as it is … But i see their point. All those yummy new tastes and textures. Yes, we would very much like to win and we do live in the U.S., or at least we did the last time I looked. Hey, ya never know until you try…. right? You’re in! Great giveaway! Goods luck to all who enters~! I, Kouga would love the treats. I’m a rescued Alaskan Malamute and I love treats. I don’t live in Kansas but live in Missouri which is next door. and still in the USA. Hi Kouga! Malamutes are my favorite, for obvious reasons! I got ya down! Thank you Rumpy for choosing us as the alternate winner for your last give away. We still live in the USA and wouldn’t mind winning something else, especially treats for the babies. Oh I don’t blame you! I got you in the drawing! Cool! Well, not in Florida, but YOU’RE cool! Thanks, Rumpy! I live in the US and my 5 pups would love it if mama won this basket! Oh I’m sure they would! These treats are really good! Hiya! I live in the US and my pup be howling with delight to be a winner 🙂 TY!! Since we’re a herd of kitties, we’ve just stopped by to say Hi and good luck to all the doggies who will be symbolically in a hat for these yummy treats! OurPeople have friends with doggies who love the NB treats. They cut them up and use them for clicker training rewards. Hi and purrs to everyone at your house, too!! I’m a Westie, my name is Scooter and I will dance for these treats!!!! Those sure do look tasty! Good luck to all the doggies who enter! I live in the US and I’d like to be a winner! My Bailey would love to win 🙂 We live the U.S.
Great give-away. BJ loves Natural Balance. I live in the US and my little pack would love to try if it is not late to enter.? I’m in the US and would love to win! WahooooZa Rumpy-Kins – Your South Carolina Grey Sisters would LOVE to win! Live in The US and would love to win this for when my friends bring their pups over, I like to have treats for them! Oh yeah Rumpy! Please enter us so that we can have some and share some with our local shelter too! Mom’s e-mail is breck1986athotmaildotcom. now off to vote for you! Have been ever day faithfully!